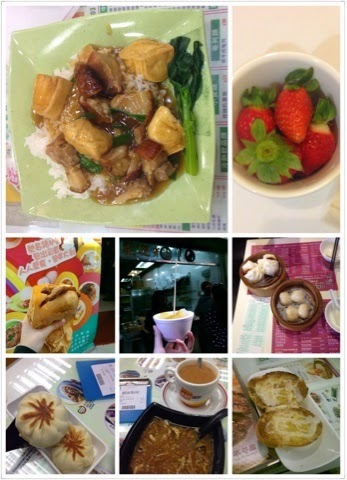 I were skeptical to go to Hong Kong for 4 days breaks as there was a lot of aviation issues. When I FINALLY decided( Should I go? Don't go? Go? Don't go? - repeat 5 times ), I bought the ticket and hopped on the plane within 2 weeks! For the 4 days trip in Hong Kong, 1.5 days were quite rainy and wet. (TT-TT) At first I were quite confused with their MTR (not MRT) but after travelled back and forth the stations many times, I am proud to say I'm expert! (? The weather for the third day was quite cloudy and appears to be rainy. I happened to walk into the tourist information center and guess what? The guide suggested me to randomly pick a bus and sat till the end of the station while enjoying the view along the way. Sounds like a good plan and I did it. What a bad quality of iPhone recording video. One of the attractions in Hong Kong is their Ding Ding bus. The bus station is not located at the side of the road, it is located in the middle of the big road. The bus does not run on fuel but by electricity cable connected at the top of the bus. Glad that they still keep this kind of buses in operations. The food schedule was decided by my friend so there was no breakfast > lunch > dinner but 1st meal > 2nd meal >....n+1 meal. I'm dissatisfied with some restaurants to limit min expenses for every customer who opt to dine it. 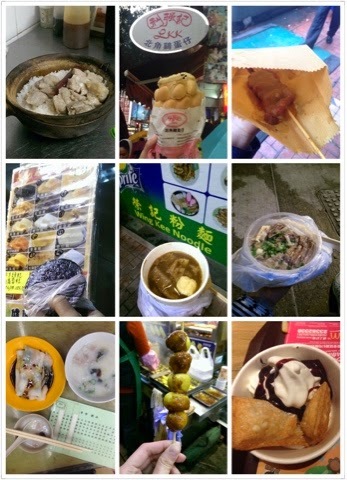 My friend and I had take outs and sat at the road side (looks pitiful!). The so-called-most-popular-beaf-noddles tastes bland and the noodles has a faint smell on it. I stole the restaurant brochure when I were strolling randomly on the street. Wish I can try their ordering service. I like the floor in Macau (confession?) 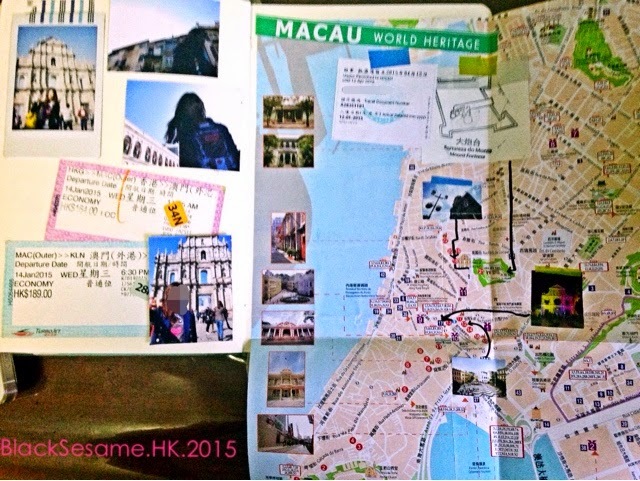 Macau gives tourist a strong Portugal vibe and the buildings and the floors (2nd confession?) are unique in their own ways. TADAAA! 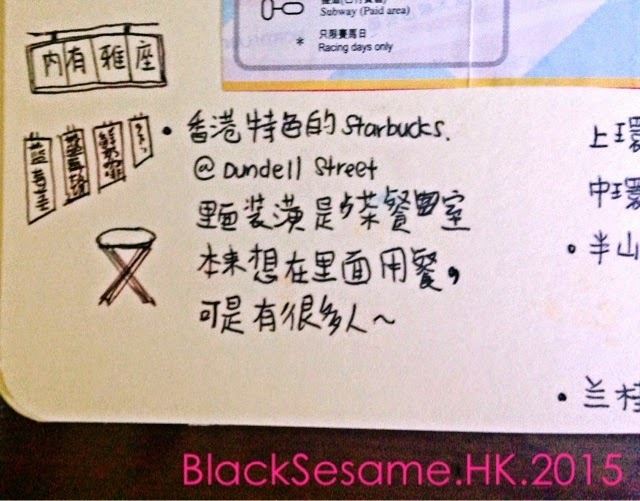 The food logs that I'm proud of and drew all the food I tasted in HK into the journal. 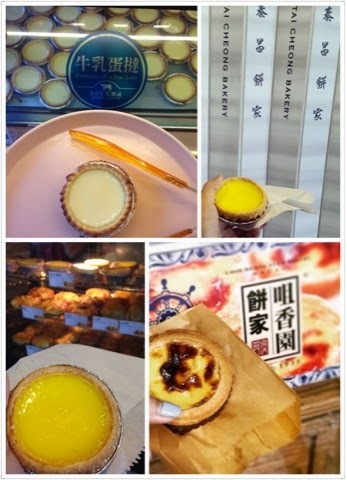 Love egg tart, love egg tart, love egg tartssss. Will I go to HK anytime again within this year? Nope in any more years unless I have another agenda. This HK trip lets me to reminisce back my old family HK trip and it was a decent choice to be a getaway for short weekend but don't go at rainy season! Heh.. This post is just to display (and brag) how much food I have eaten. 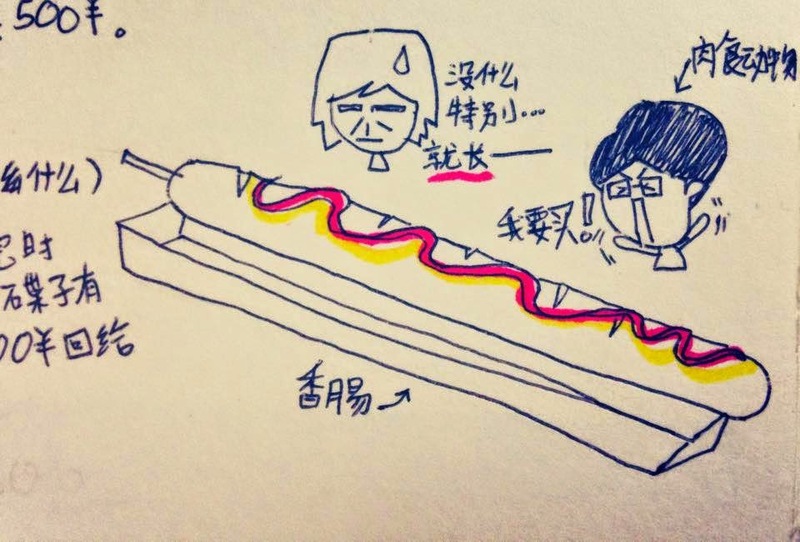 Is Tokyo banana cake that good? 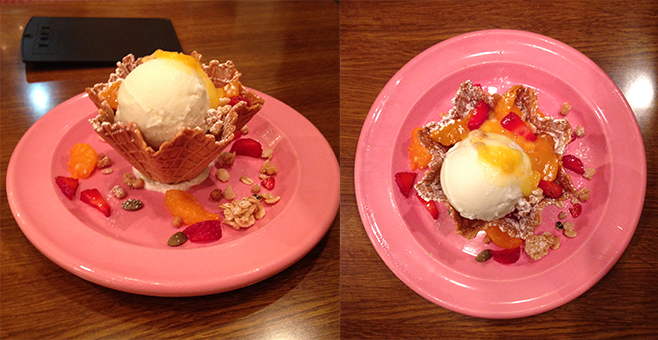 It deemed as a omiyage for friends but I didn't find it special. 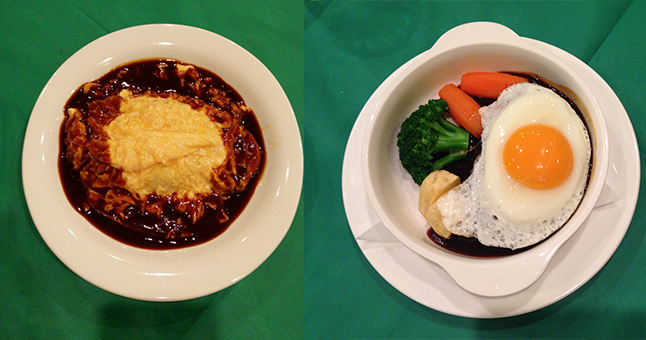 My brother searched online for popular omurice at Asakusa (we stayed at Asakusa, read this) and we ended up found this. A place that looked like decent hotel restaurant but it is not a hotel. There was an old lady served us and we kept analysed her whether is she the owner of this restaurant (like undercover or something) or this restaurant is managed by three-generation family. The restaurant situated in a quiet neighbourhood and there wasn't any other eateries around. Like this very much. Singapore and Malaysia sushi never taste as fresh and fulfilling as in Tokyo. My parents don't really okay with eating raw food because they think your brain will full of worms and bacteria as it is not cooked so eating sushi is a hard task because we need to find a sushi bar has a few more choices of cooked sushi for them. Last meals at airport - taste good! The ice cream is made from yogurt and it may tastes a bit more sour for some people but I felt really excited when I tasted it (like on heroin. Kidding) After my brother and I sent my parents back to the guesthouse to rest while my brother went to Akihabara AGAIN to explore his anime stuffs, finally I have time to satisfy my sweet tooth. Totally amazed by it. What a sparkling golden tower! If I live near this place, I can basically stare at this blankly to relax my mind everyday for some time. I wonder if Paris tower as beautiful as this. Asakusa is a bit far from city but you will get the feeling of small town and away from the town buzz but still have something worth to explore. After we reached the guesthouse at 1am and settled down, we went out loitering around. My brother did not need sweater at all because the weather is chilling. Really like the environment and I still feel safe if I'm alone(I didn't walked into dark alleys of course). There was some drunk businessmen came out of the restaurants. Totally satisfied with the my accommodation location. I have been giving my parents some mentally prepare about how Japan rooms will be not as big as Malaysia does given with its compact popularity but my mom still intimidated with the toilet size (Yup, can't barely move around) and she shied away from getting water from the kitchen because there was other foreigners at the common area. For me, I'm really like this accomodation. The location is so near with Sensoji temple which I went there every day (Ahem, more explanations below) and there is bicycle rental services nearby! Too bad the staffs have much hospitality enough because they will only do their things without the talking or just answer your questions. They are helpful but not warm which I'm disappointed because I were hoping to make some new friends. I'm sure the locals in Asakusa see visitors ALWAYS lurking around but I guess they get used to it because I'm THE ONE lurking around. 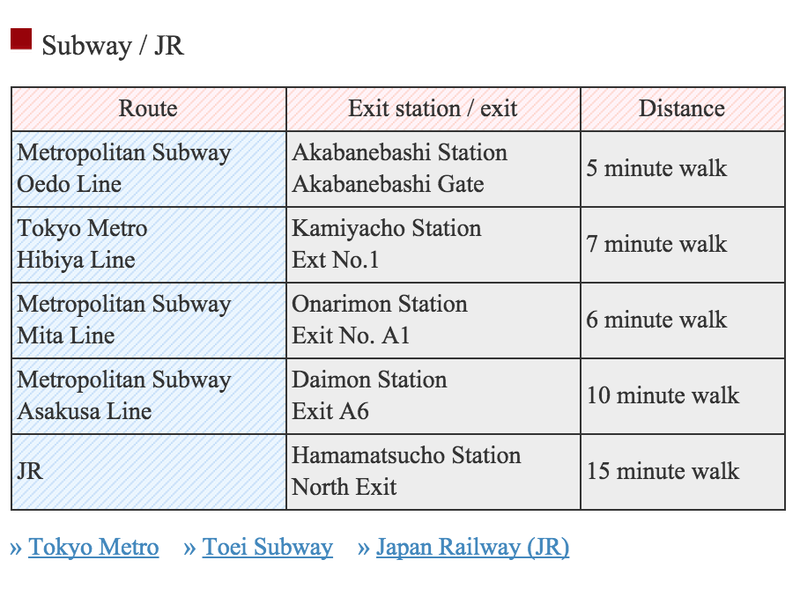 For my 7-days in Tokyo, I woke up early (8am-9am) morning to walk around for the sake of exploring around. Mothers ride bicycle with toddlers behind them to send them off to the kindergarten(So cute). Children sit comfortably behind wheels(like a boss). Some fathers walk with their children to send them as well. There was some senior citizens playing hockey-style of pool game (a long hammer stick - upside down to hit a tennis-sized ball) in a field. Looked like a serious competition going on. During my stays in Tokyo, I did not went into the shopping malls at all (except when there was sunny raining). We just went to flea markets and streets shopping because Singapore has enough H&M and Uniqlo (no thanks). We bought a lot of street foods. If you convert the currency into SingDollars, you will eat comfortably. If you convert the currency to RM, you will starve and dehydrated (I'm not rich enough not to care).